How many superlatives, clichés or expletives could have summed up our night at the Regional Final of HSBC’s Business thinking competition? Well…it is surprising just how many there are that can’t be repeated! 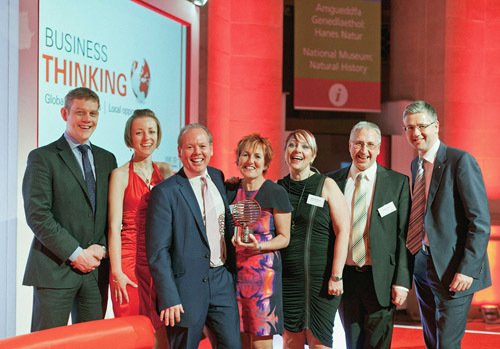 The culmination of the HSBC ‘Business Thinking’ competition was held at the National Museum of Wales, Cardiff on the 22nd March 2012; amongst the finalists – Chepstow Plant Services. This is a competition in which we were pitched against some truly inspiring businesses from entirely unrelated sectors and therefore HSBC and their independent judging panel had a truly difficult task to select a winner. HSBC’s Business Thinking competition epitomises what Chepstow Plant Services do as a business – establish global connections from a local base. Forging relationships with people that are valued by people who care passionately about what they do. “To have been involved in this process has made us take stock of what makes us good at what we do and how that translates into success.” Sian Williams – Finance Director. Five finalists from the whole application process gathered on the evening to await their fate; all had put an enormous amount into the competition and every bit of effort was reflective of their commitment and passion to their businesses. It is for the very reason that our passion for our customers and our business that Chepstow Plant Services won this prestigious award. “We have met and forged relationships with some very inspiring people and impressive companies in this competition and it was really down to our team spirit, focus, dedication and passion that the panel have rewarded us.” Jon Williams – Managing Director. An evening which was fuelled by nervous tension, apprehension and that ever present sensation excitement culminated in the announcement that the team here at Chepstow Plant Services had been rewarded for that dedication and passion by winning the Regional Final. Chepstow Plant Services are pleased to announce their success as a winner amongst a talented and passionate group of companies with whom we are really pleased to say that we have developed valuable and lasting relationships. HSBC as a partner have been instrumental in our success and their motto ‘Global Connections, Local Opportunities’ really sums up our business and passion. We recognise that the experience of our customers and indeed that of our supply base is vitally important and our team is so dedicated to delivering for each other that everyone that is in contact with us feels the passion we have for what we do and obviously HSBC’s independent judging panel felt the same. The setting at the National Museum, Cardiff could not have been better and the night was topped off by the award. The next phase of this competition will see Chepstow Plant competing at the National level and hoping that our determination and passion wins through again.